Darkness wars with darkness as the hard-bitten men of the Black Company take their pay and do what they must. They bury their doubts with their dead. Then comes the prophecy: The White Rose has been reborn, somewhere, to embody good once more.... This omnibus edition comprises "The Black Company," "Shadows Linger," and "The White Rose." Glen Cook lives in St. Louis, Missouri. Darkness wars with darkness as the hard-bitten men of the Black Company take their pay and do what they must. They bury their doubts with their dead. Then comes the prophecy: The White Rose has been reborn, somewhere, to embody good once more. This omnibus edition of one of the great fantasy epics collects "The Black Company," "Shadows Linger" and "The White Rose" into one volume. 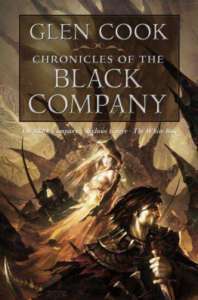 "With the Black Company series Glen Cook single-handedly changed the face of fantasy--something a lot of people didn't notice and maybe still don't. He brought the story down to a human level, dispensing with the cliche archetypes of princes, kings, and evil sorcerers. Reading his stuff was like reading Vietnam War fiction on peyote." --Steven Erikson, author of "Gardens of the Moon"